Using a robot in the food production tasks involves much more than just making the right decisions to increase productivity. Industrial Robots not only will increase productivity, but also reduce the occurrence of accident at works and improve hygiene. The food industry needs to follow strict hygiene and high standards. 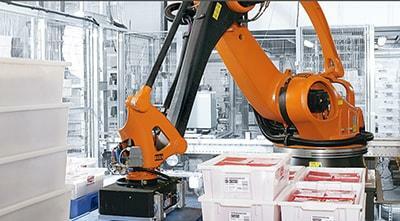 However, modern robots feature improved sanitary designs making them ideal for work in this clean environment. The environmental conditions- Corrosive resistant properties. Internationally scale that relates to proven protection against environmental factors such as liquids and solids. (IP65 – Dust proof, protected from splashes and low-pressure jets). Hygiene cover that easy washed down and changed. A wide variety of end of arm or grippers tools are capable of handling from single products to full rows, and even entire layers of product depending on customer needs. Phoenix will provide a customize automation solutions.